The VA Home Loans guaranty program is one of the most often-used benefits available to US military veterans. Since the program's inception in 1944, the Veterans Administration has guaranteed more than 18 million home loans to veterans, to buy or build a home, or to refinance another loan on more favorable terms. The objective of the program is to assist eligible veterans to become homeowners. Many times, VA home loans make mortgages available to veterans who otherwise would not be able to get mortgage credit to buy their own homes. To find out if you are eligible for a VA loan, and what size loan you can qualify for, complete the form below. In most areas of the country, the maximum VA loan size was recently increased to $729,000. Contrary to popular belief, VA home loans are not loans made by the Veterans Administration. 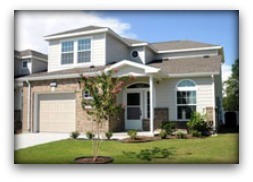 Rather, when purchasers obtain VA mortgage loans, a percentage of the loan is guaranteed by the VA. If the borrower defaults, the government pays the lender the guaranteed amount, thus reducing the lender's risk and encouraging lenders to originate loans to military veterans. No Down Payment: With VA home loans, the borrower can often finance 100% of the home's value, thus requiring no down payment. Conventional mortgage loans often require 5-20% down. No Private Mortgage Insurance: Because they are guaranteed by the government, VA home loans do not require the borrower to pay for private mortgage insurance (PMI). That results in a lower monthly payment. Lower Interest Rates: VA home loans traditionally offer lower interest rates than conventional mortgage loans, saving you thousands of dollars over the life of the loan. Depending on the interest rate and the size of your loan, this could lower your payments by $100 or more every month. Easier Qualifying: With the stricter qualifying requirements of conventional loans, as many as 80% of veterans and active duty service members may not qualify. The less restrictive VA requirements make it possible for more military members to achieve the American Dream of owning their own home. No Out-of-Pocket Closing Costs: Many times, on a VA loan, you will not have to pay the upfront fees associated with the loan, such as origination fees, underwriting fees, processing fees, etc. ; the VA will allow the seller to pay them for you. And often, you can include the VA funding fee in the loan rather than having to pay it out of pocket. No Prepayment Penalty: With VA home loans, there is no prepayment penalty if you pay off the loan early, such as when you refinance or sell your home. On many conventional mortgage loans, especially if your credit is not the best, there will be a prepayment penalty if you sell the home or pay it off early with a refinance. Assumable Mortgage: VA mortgage loans are assumable, meaning that when you sell your home, the new buyer can assume the loan. That is often an attractive selling feature, especially if your interest rate is lower than the current mortgage rates, or better than the buyer could get with his credit. *But you should be aware that if you allow your VA home loan to be assumed, you would not be eligible to restore your full VA loan eligibility for another loan until the previous VA loan is paid off. Any unused amount may be available, however. Fill out the information requested in the form above, and speak with our VA loan specialists for more details. Additional Benefits for Disabled Veterans: For veterans rated with a 10% or greater disability, VA will waive the funding fee for VA home loans. Veterans with a permanent and service-connected 100% disability may also be eligible for a grant of up to $50,000 to adapt the home to accommodate their disability. Learn what your monthly payments would be for the home of your dreams with this VA Home Loans Calculator. And remember that your BAH can be used to make your mortgage payment. Recap of Veterans Legislation for 2010.